Chicago’s theater productions are not only numerous and doing well, they are often extended to accommodate demand. Here are four show extensions with widely-different styles and themes that you might want to see. A moving story with book and lyrics by Pulitzer Prize winner Tony Kushner (Angels in America) and score by Jeanine Tesori (Fun Home, Violet) the show has been extended to Nov. 11, 2018. It is a Firebrand Theatre/ TimeLine Theatre production at The Den Theatre, 1329-1333 N. Milwaukee Ave. For tickets and other information call (773) 697-3830 and visit Firebrandtheatre. For more about the show visit Change can be difficult. Steppenwolf Theatre Company extends its world premiere production of a difficult subject by Pulitzer Prize-winning ensemble member Bruce Norris through Nov. 18, 2018. For reviews of the show visit TheatreInChicago. For tickets call (312) 335-1650 and visit Steppenwolf. 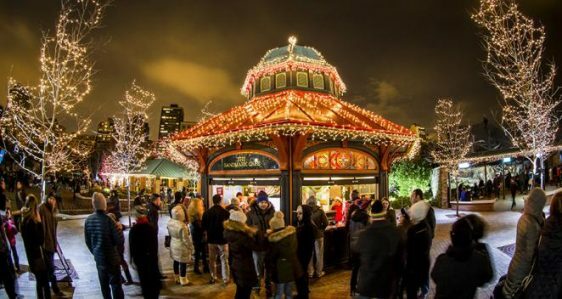 The Chicago premiere of this funny salute to friendship, fitness and food at the Royal George Theatre, 1641 N Halsted St.,has been extended through Dec. 31, 2018. For tickets and more information visit WaistWatcher the Musical. For a review of the show visit WaistWatchers. Once again, Lin-Manuel Miranda’s mega hit about Alexander Hamilton co-starring his wife and her family and his fellow founding fathers, has been extended. Tickets are available through May 26, 2019. The show is at the Private Bank Theatre, 18 W. Monroe St. For tickets and other information visit Broadway In Chicago. 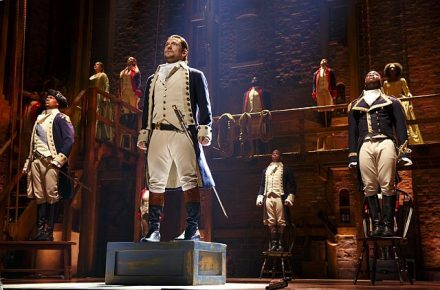 For more about the show and to see a review visit Hamilton is worth the hype. 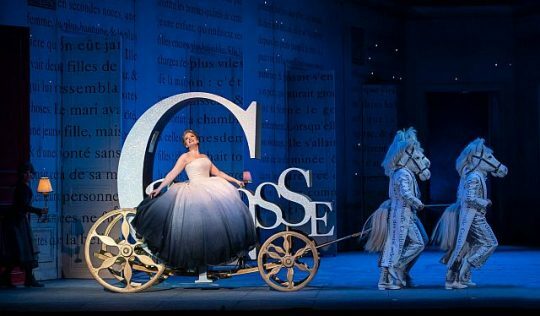 With so many shows in Chicago it is easy to miss one you really meant to see. So here is a reminder of really fine productions that end this month of January, 2018. 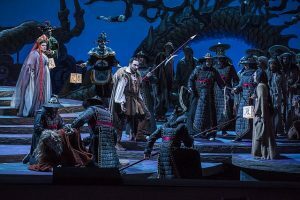 ‘Turandot,’ Puccini’s glorious fantasy musical portrayal of a cold-hearted princess in ancient China is at the Lyric Opera for just two more performances: Jan. 21 and Jan. 28. For tickets and more information visit Lyric Turandot and Lyric Opera. ‘Wicked,’ that musical story about the two witches of OZ, closes at the Oriental Theatre, Jan. 21. For more information and tickets visit Broadway in Chicago Wicked. 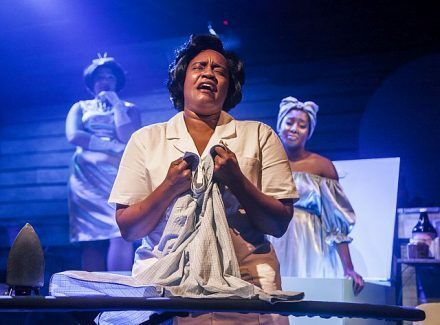 ‘BLKS,’ a play that tells about a day in the life of four young black women in New York City is at Steppenwolf just through Jan. 21. For more information and tickets visit Steppenwolf. ‘Beautiful: The Carole King Musical’ has its final performance at the Cadillac Palace Theatre Jan. 28. For more information and tickets visit Broadway in Chicago Beautiful. 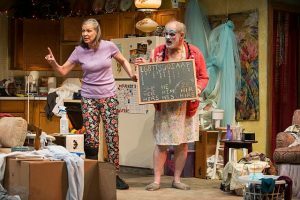 Premiering now at Steppenwolf Theatre through Dec. 31, 2017, ‘The Minutes’ is a dark comedy which turns out to be a scary, unfunny, toe-dip into the troubled waters of small-town USA. The scene is a city council meeting in Big Cherry (you pick a state). As a former reporter who has covered meetings at the city, county and school board level, I can attest that David Zinn’s set design is right on as far as the seats, desks and ceiling are concerned. (The mural is an added patriotic touch). However, you know something is wrong when the meeting is announced as closed, even though no legal reason is given such as personnel or law suit. Even if those items are only briefly mentioned during the closed session, they still should have been offered at the start of the meeting as an excuse for going into a closed session. Apparently there was no public to complain but maybe the public in this town knows that all council meetings are held in closed session. But then, as each council member states an item of business, from Francis Guinan as the doddering Mr. Oldfield to Danny McCarthy as Mr. Hanratty who has drawn up plans to redo the town’s fountain with a ramp for disabled visitors, the meeting appears to be routine. At least in the beginning. One of the worms that rots the fabric of life in Big Cherry is that its founding is based on a battle that happened almost just the opposite of what is celebrated in town every year, as researched by Mr. Carp, one of the council members. The other problem is that Carp, well portrayed by Ian Barford, also uncovered a city official’s criminal action regarding the disposal of stolen bikes. But in this small town that does not want rotten apples to upset its rosy apple cart, politics and threats make the worms disappear. 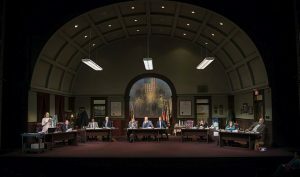 The play’s title refers to the uncovering of the worms when Cliff Chamberlain as new council member, Mr. Peel, wants to hear the minutes from the meeting he missed when he was at his mother’s funeral. Those minutes reflect Carp’s complaints and concerns. Peel is told by Mayor Superba, the forcefully restrained William Petersen, that the minutes have not been prepared for distribution. All is revealed when the Ms Johnson, an honest clerk nicely interpreted by Brittany Burch, says they have been prepared. The other council members who always go along with the Mayor are Mr. Breeing (Kevin Anderson), Mr. Blake (James Vincent Meredith) Mrs. Matz (Sally Murphy), Ms Innwa (Penny Slusher) and Mr. Assalone (Jeff Still). Directed by Anna D. Shapiro, the acting is superb. The problem I have with the play is that its ending feels a bit off given the town’s attitude toward its heritage. Though the ending, (no spoiler alert here) delves into what may be the true nature of a group when divested of its respectable trappings, it would have been more understandable if the group circled in the dark with candles or adopted another ritual. 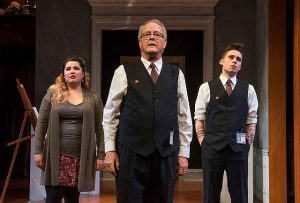 DETAILS: ‘The Minutes’ is at Steppenwolf Theatre, 1650 N Halsted St, through Dec. 31, 2017. Running time: 1 hour, 40 minutes, no intermission. For tickets and other information call 312-335-1650 or visit Steppenwolf. Several stage productions gladden the December holiday season and there are romantic comedies perfect for February. But when it comes to October, there’s usually a dearth of plays that chill the soul. Not so, this October with three classics to see. The ‘Man-Beast’ at First Folio Theatre fits the haunting season. Photo from First Folio. Steppenwolf Theatre Company is doing Arthur Miller’s 1953 scary in a what-can-happen way when seemingly normal neighbors believe the stories behind the Salem Witch Trials. The play is part of the Steppenwolf for Young Adults series but it really is a play for all generations. Running for only eight public performances from Oct. 4 through Oct. 21, 2017, it’s a chilling reminder of how fake news can spread as if true and the harm it can do. For tickets ($20 general and $15 students) visit Steppenwolf or call (312) 335-1650. 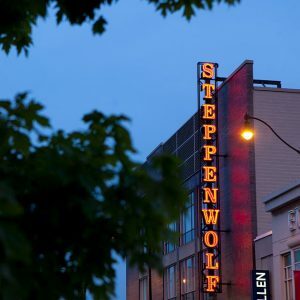 Steppenwolf Theatre Company is at 1650 N. Halsted St. Chicago. First Folio Theatre at the possibly haunted Mayslake Peabody Estate, is doing the world premiere of Joseph Zettelmaier’s ‘The Man-Beast.’ Based on a French legendary werewolf, it’s the third play in his triology of ‘The Gravedigger’ and ‘Dr. Seward’s Dracula.’ The play runs from Oct. 7 through Nov. 5, 2017. Get tickets if you dare see it at First Folio or by calling (630) 986-8067. Located in a Du Page County forest preserve, First Folio is at 31st St. and Rt. 83 in Oak Brook. Henrik Ibsen’s “Ghosts,” a drams that starts out innocently enough with a woman opening an orphanage as a tribute to her dead husband, becomes a dark comedy in the hands of writer Gustav Tegby. Translated by Chad Eric Bergman, the play takes a strange turn when the woman’s estate hosts ghosts and the un-dead. The play is presented by Akvavit Theatre at the Strawdog Theatre Company now through Oct. 29, 2017. For tickets go to Chicago Nordic. 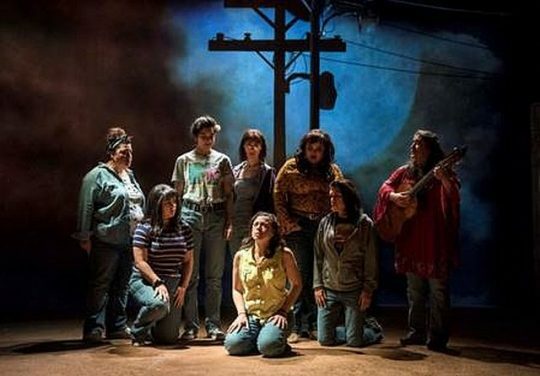 Strawdog Theatre Company is at 1802 W. Berenice, Chicago. 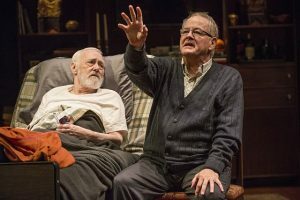 It is always a treat to see longtime Steppenwolf actors John Mahoney or Francis Guinan in a play. 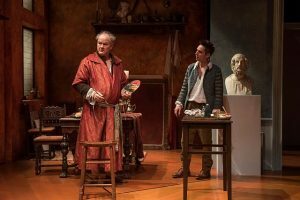 In ‘The Rembrandt,’ now in Steppenwolf’s Upstairs Theatre, audiences get both outstanding actors. Written by playwright/actor Jessica Dickey, the premise seems to be that art in a museum may affect viewers whether they are guards or visitors, not just differently, but also on a more sublime level. Guinan as Henry, a museum guard whose duties include looking for any problem nicks, can imagine the paintings coming alive at night. He thinks their artists may even converse with each other. Gabriel Ruiz as gun-carrying security guard Jonny, is Simon’s friend but he sees his job as protecting the paintings. The two approaches clash when Henry is encouraged to touch the Rembrandt by both a new, rule-defying, apprentice/guard, Dodger, played by Ty Olwin, and by copyist Madeline, portrayed with humor by Karen Rodriguez. That happens even though Madeline earlier discouraged such an idea when proposed by Dodger because fingers contain harmful substances. After discussing elements of the painting the three of them do touch it. The next scene is in Rembrandt’s house. It’s as if touching the painting opened a portal to its historic past. A note about historic accuracy: 17th century Dutch Master Rembrandt van Rijn did favor the black and muted colors except for his famed luminescent whitish tones as mentioned in the play. But unlike the reference to blue, he did use blue shades though primarily in his biblical and mythological subjects. Francis Guinan (Rembrandt) works on a painting for an Italian art patron while Ty Olwin (Titus) looks on. And yes, in spite of the nice commissions given to this master painter, he did over spend so ended up in debt as referred to in the play. The portal idea continues when Olwin, now Rembrandt’s son, Titus, touches a bust of Homer that supposedly was in the painting and in Rembrandt’s home. The next scene is a soliloquy by Mahoney as Homer expounding on the merits of poetry. The final scene is at Henry’s home where he is disconsolate with grief and guilt as he sits at the sick bed of his longtime partner, Simon (Mahoney) who is dying with stage four cancer. That scene clarifies the play’s underlying themes of grief, death and love. Madeline had taken the art course that brought her to the museum because the grandmother who cared for her had become ill and recently died. She felt love, grief and also guilt that she thought death was OK because her grandmother had deteriorated so much. Henry who dearly loved Simon, experienced remorse for not being a more considerate partner when Simon was healthy. John Mahoney (Simon) l, and Francis Guinan (Henry) in ‘The Rembrandt’ at Steppenwolf. In the Rembrandt home scene, Rodriguez who is now Rembrandt’s lover, Henny, demonstrates her love and Titus expresses love for his father while remonstrating against his spending excesses. Well directed by Hallie Gordon with excellent set design by Regina Garcia and fine costume design by Jenny Mannis, the play raises interesting ideas to ponder about art and personal relationships. ‘The Rembrandt’ is at Steppenwolf’s Upstairs Theatre, 1650 N. Halsted, Chicago, through Nov. 5, 2017. Francis Guinan is Henry and Rembrandt through Oct. 22. The role will be then be taken on by Joe Dempsey through the last performance. For tickets and other information call (312) 335-1650 and visit Steppenwolf. Not Him, not Her but ‘Hir.’ The title sums up the gender neutral and cross gender designations of the thought processes, actions and reactions in the Taylor Mac play now at Steppenwolf Theatre. Paige, the mom, perfectly portrayed by Amy Morton as a woman finally liberated from a tyrannical husband and household drudgery, says “I don’t do laundry anymore.” She adds, “We don’t do order.” Paige encourages her daughter to take testosterone shots. The daughter, Max/Maxine, finely articulated by Em Grosland, well explains the world as seen by Mac, a highly honored playwright who has adopted the gender title of “judy” (yes, lowercase) to describe himself. Then there is Arnold, Paige’s husband well interpreted by Francis Guinan who, before he had a stroke, expressed his extreme dissatisfaction with a changing, more culturally accepting society by beating up everyone in his family including the dog. Paige is feeding him estrogen hormones and puts him in a dress and wig to emasculate him. Complicating the scenario is Isaac, the “prodigal” son portrayed by Ty Olwin, a dishonorably discharged marine. He comes home from Afghanistan to find a messy house and a disabled father who is more like a clown than the fierce neighborhood nemesis he had been. The initial shock of seeing ‘Hir’s’ messy set that opens Act 1 role forward on the stage with a grotesquely made-up, seated clown-like figure, becomes more understandable when Paige declares she is now free to work outside the home and does so and later, when Isaac reminds his dad that he used to beat up the family. Coming to Chicago shortly after the Pride Parade and court rulings on gender neutral bathrooms, the play is a relevant look at some of the changes taking place while also delving into the anger displayed from some segments of the old guard who still believe in cultural, religious and sexual discrimination. Directed with great insight by Hallie Gordon, ‘Hir’ is a well-thought-out absurd dark comedy by Mac, a multi-talented New York playwright, actor, director, producer, performance artists who has received, among other honors, the Kennedy Prize, the Helen Merrill Playwriting Award, a NY Drama Critics Award and two Obies. 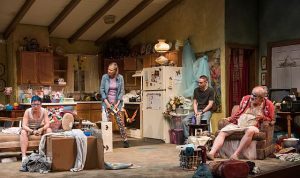 DETAILS: ‘Hir’ is at Steppenwolf, 1650 N. Halsted St, Chicago, through Aug. 20, 2017. For tickets and other information call (312) 335-1650 and visit Steppenwolf. 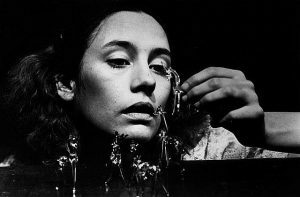 When the list of nominees for 2017 Best Leading Actress in a Play were read at the Tony Awards Sunday, June 11, Laurie Metcalf’s name would have sounded familiar to many Chicago theater-goers. Metcalf was nominated for her outstanding performance in Lucas Hnath’s “A Doll’s House, Part 2,” a sequel to the Ibsen’s classic directed by Sam Gold. But Chicagoans who have been following Metcalf’s career with Steppenwolf Theatre likely know she was an original ensemble member of the world-renown company. They may remember that she was in the company’s critically acclaimed “Balm in Gilead” production in 1984 that won her the 1984 Obie for Best Actress. However, even though she has been in more than 40 Steppenwolf productions, Metcalf is not just a familiar Chicago figure. She received Tony nominations for “Misery, “November” and “The Other Place” and starred in the Steppenwolf production of “Domesticated” at the Lincoln Center Theater in 2014.